"...beautiful book with many wonderful poems...will be passing this around..."
Access the entire Funeral Poems and Reflections - Vol I book for free through your Prime account. *This poem, "Together Again” in the Mother Version, is copyrighted and is not a public domain work. Please be aware that some rights are reserved. 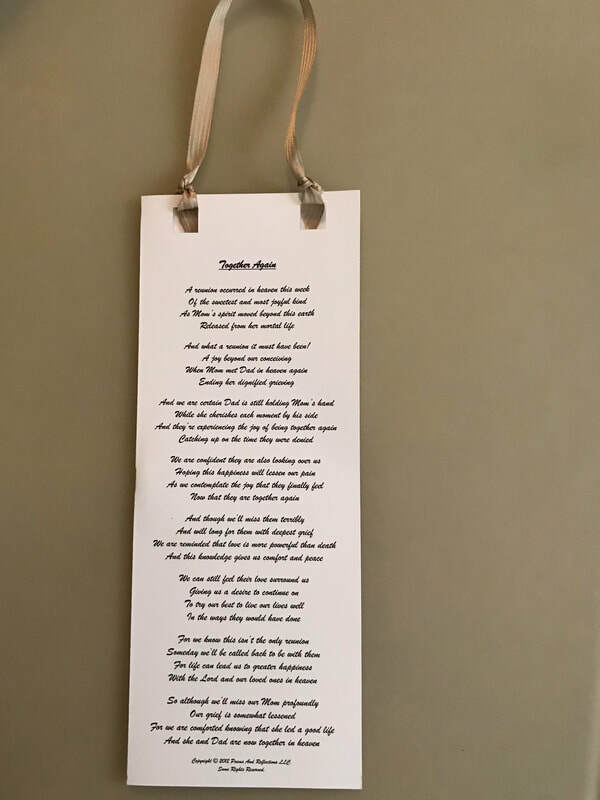 Acceptable uses of this poem are for an individual to read it, or to print it on a funeral program to be shared with the family and friends who are the mourners attending a funeral, wake, or memorial service. 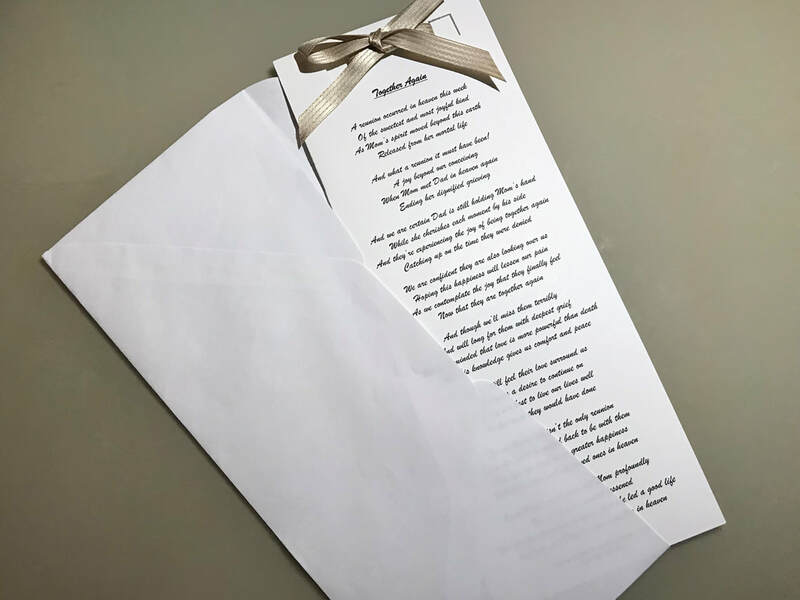 If printed by a religious organization, funeral home, celebrant, or a printing company, the poem needs to be accessed by the individual customer/ parishioner and forwarded to the enterprise. It is not to be reproduced in any income-generating or non-personal mass-media format. This poem may be posted on a personal web page or a personal social media web page as long as the copyright information is included and the www.poemsandreflections.com website link is included. It may also be printed in an obituary as long as the copyright information is included and the www.poemsandreflections.com website address is included. We hope that this poem will honor the true love between a mom and dad as they are reunited again in heaven. And what a reunion it must have been! Copyright © 2012 Poems and Reflections LLC. Some Rights Reserved. "Poems And Reflections - Vol I". We hope that they will comfort you and help you to honor your loved one. 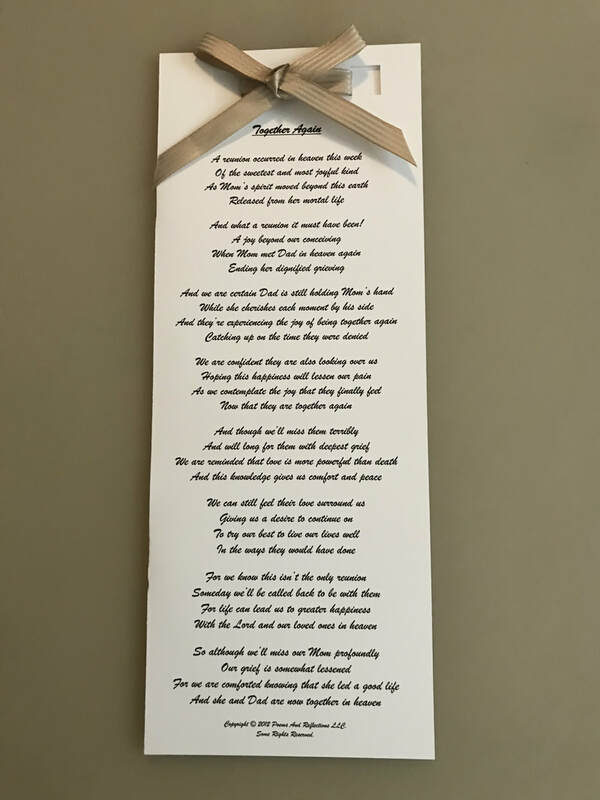 Order this poem in a sympathy card and memorial keepsake.